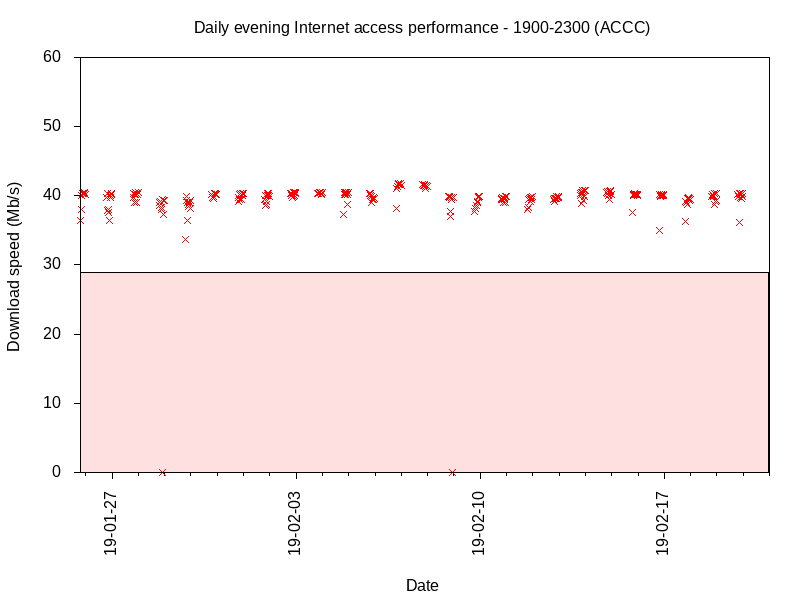 Above are the results of file transfer tests conducted automatically, the above are filtered for those in the ACCC’s defined “evening hours” on which they base their service level enforcement. All x symbols in the pink area break the 30Mb/s minimum. Note the number of x symbols on the speed=zero axis. Above is a wider view of the download tests. It can be seen that on some days, most are around 39Mb/s, but on other days they are strung out down into the low single digits or even zero. This had significant impact on ordinary browsing activity where screens were very slow to paint at times. 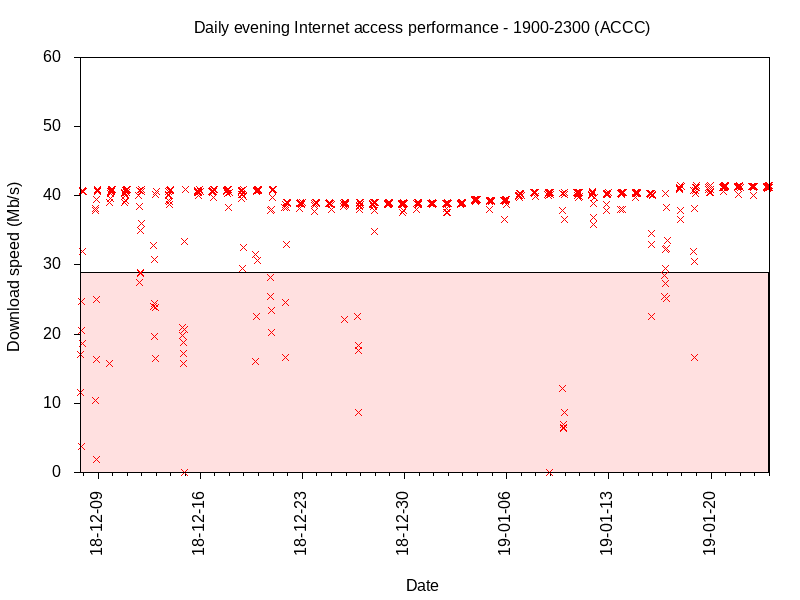 Note that congestion degraded performance is not limited to evening hours. The characteristic of pipes carrying traffic is that performance degrades very quickly when utilisation reaches a critical value, the suppliers business is about proactively managing the timely provision of capacity to stay ahead of demand. The graph above does not suggest that Exetel are on top of it. nbnCo had predicted that traffic levels in December would be around 21% higher than the yearly average. 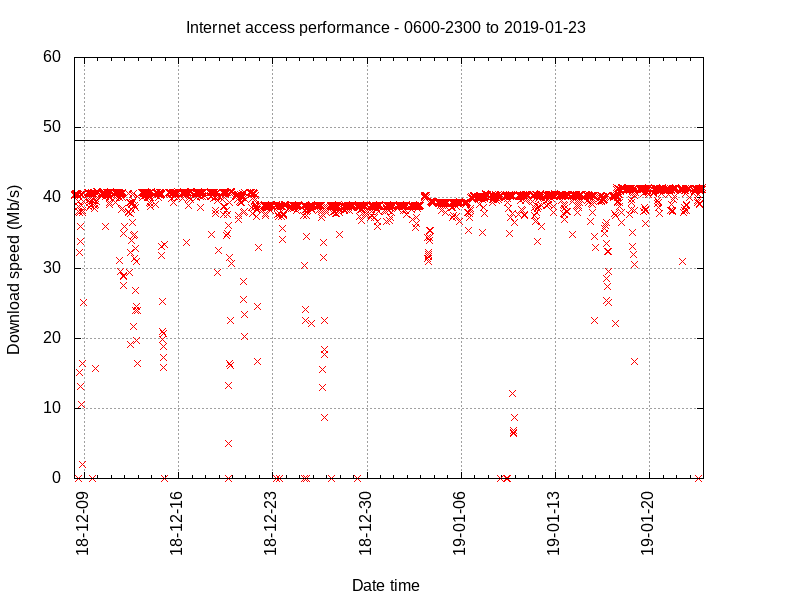 Above is a plot of the IX aggregate speed for NSW over the last 90 days, and there is a distinct increase in traffic levels in December where peaks were commonly 25% higher in the earlier months. 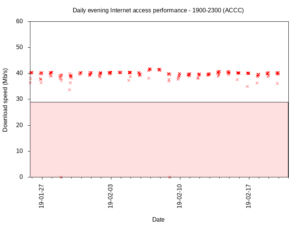 When system links reach critical utilisation levels, performance degrades very quickly, and this is the likely explanation of the observation that days are either fairly good or fairly poor. Exetel responded to the report of low speeds by stating that since the service was in coexistence mode, there were no speed guarantees (even poorer than NBN’s get out of jail committment). 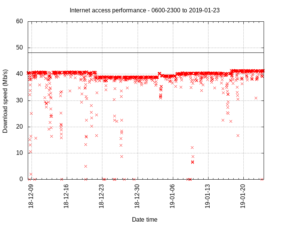 History with other providers shows the coexistence excuse to be lame, an nbnCo ruse, and for this reason, another RSP will be chosen. 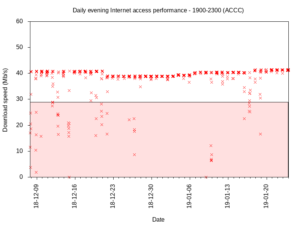 The chart above of evening speeds during the period of service of the subsequent RSP (Sumo/Optus) contrasts sharply with the corresponding Exetel graph given earlier, and shows what a sham the coexistence condition is, it is simply a way to avoid commitment to speed and the period of coexistence is at nbnCo’s pleasure.